JASTA cosponsors Sen. John Cornyn (R-TX) and Sen. Chuck Schumer (D-NY) exit a news conference on May 17. In a unanimous voice vote on May 17, the U.S. Senate approved the Justice Against Sponsors of Terrorism Act (JASTA), which permits victims of terror attacks on U.S. soil and their surviving family members to bring lawsuits against foreign governments for supporting terrorism. In particular, it permits lawsuits against the Saudi government for its alleged role in 9/11. 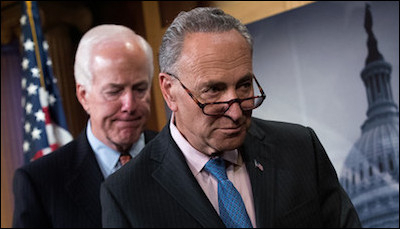 Arguing in favor of the bill, Sen. Chuck Schumer noted that, "If the Saudis did not participate in this terrorism, they have nothing to fear about going to court. If they did, they should be held accountable." The attorney general, in turn, can petition the court for an extension of the stay for "additional 180-day periods," effectively delaying lawsuits against the Saudis indefinitely. Add to this that the House is unlikely to take up the bill, Obama is opposed to it, and the Saudi government has mobilized against it, and the vote does appear to be, as Sperry calls it, "a cruel hoax." It's tricks like this that fuel support on the Left (Sanders) and Right (Trump) for candidates who promise integrity in government.